A couple’s world is turned upside down when a friend visits in this Kafkaesque literary thriller by debut novelist Condran. Married for a decade, Americans Henry and Stephanie have settled into a comfortable life in Prague, where she works for the State Department and he owns a shop specializing in rare books. 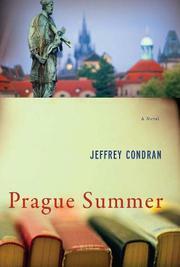 Condran channels his love of literature and the city of Prague through Henry’s many allusions to literary works and Czech landmarks. When Stephanie’s old college friend Selma Al-Khateeb plans a visit, she immediately jumps into protective mode. Stephanie and her former roommates always considered Selma special, the best among them, but lately, Selma’s life has been nothing short of surreal. Her husband, Mansour, arrested under the Patriot Act, has been held in federal custody for more than a year without being charged, and Selma’s exhausted all avenues of help. Stephanie and Henry view Selma’s visit as a chance for her to catch her breath and have a diversion from these disturbing events, but for Selma, her visit holds a deeper purpose. She’s damaged and frightened, and Henry’s strong reaction to her presence results in unanticipated feelings and actions that threaten to overpower his life. On the one hand, he continues to conduct business, while on the other, he takes Selma on a routine literary tour of Prague that ends with a frantic plea. Unwilling to cross certain boundaries, Henry tries to help but knows his attempt is more an empty gesture than an effective solution. Eventually, a business trip to evaluate and catalog a rare-book collection changes his entire perspective. Fluctuating between wry observation and solemn introspection, this is an expressive, tantalizing and ingeniously constructed study of human character.